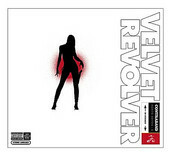 Velvet Revolver rocks. And that's all. I'm not even going to bother parroting back the drug addled drama that has surrounded the members of Velvet Revolver, since you've probably heard it all before. In fact, even if you somehow avoided hearing about these guys you probably heard about Audioslave right? It's the same basic story except turned up to 11. First we're dealing with friggin' Guns and Roses refugees here, not some boring ol' leftovers from Rage Against the Machine. And you might remember that Chris Cornell was in rehab during the early days of Audioslave for alcoholism. Big deal! Velvet Revolver's Scott Weiland was in rehab because he was addicted to everything. But aside from the fact that both bands have really stupid names, they really don't have anything in common beyond their origin stories. What totally took me by surprise was that these guys actually sound like a legitimate band. They don't sound much like either STP or GNR which makes the band seem like more than the marketing campaign they started out as. They stuck to their roots closely enough that people who were fans of their old bands will probably find something to enjoy here, but the overall sound is different enough to avoid being needlessly trite. Good for them. Too bad most of their first album isn't very good. Here's the deal; You could have nothing but geniuses playing on your album, but if the songs blow then nobody is going to care. Sadly, despite some good performances, most of the material here is just plain dull. It starts out semi-promisingly enough with "Sucker Train Blues" but even on first listen you'll notice that it sounds an awful lot like that "Slither" song they've been playing on the radio. The second track, "Do It For the Kids" is one of the albums best, but again, it's just more of the same. Out of the thirteen tracks, only three break the formula of fast, loud, rock songs. One of them, "Fall to Pieces" is a power ballad in the truest sense (in a mostly good way), and will probably end up being a big radio hit if it isn't already. It's the only track out of "The Slow Three" that doesn't sound terribly out of place. "Loving the Alien" is just alright but it would sound bizarre if it wasn't placed strategically at the end of the album. Then there's "You Got No Right" which is just frustrating because every time it starts to show promise, it falls apart. Take this lyric for example: "Funny right here I find myself/ inside a paper cup/ without a warning or a reason it's a treason/ with no answer" Wuh? While we're on the subject of lyrics, most of them deal with recovery from addiction and sounds like they were cribbed from motivational posters in Scott's detox facility (a la Metallica's disastrous St. Anger album-- only not as bad). Elsewhere, Scott sings about rocking out, and other generic stuff. Honestly, I had to sit down and read over the lyric sheet once because most of this is so typical it didn't even sink in the first few times through. You'll take notice of "Big Machine" which appears to be Scott raging against the horrors of fame like he was the first guy to get followed by paparazzi. Honestly, if I wanted to hear that kind of thing, I'd go and sit through Van Morrison's last album. So there you go. If you like "Slither" you might be in luck because there are ten more songs on here that sound an awful lot like it. However, most of us will get sick of listening to these legitimately talented musicians squandered on such dippy material. Slash in particular seems wasted on simple, repetitive song structure, and his style here almost sounds more suited for punk than hard rock. Every once in awhile he busts out a solo and reminds the listener who he is, but it's too little too late. Between that and the general repetitiveness of the album, there's little to recommend here. Look for this album to soon bloat the used racks next to the Velvet Underground section. Oh, and what's up with that album title? Contraband? As in "Contra-band"? Oh gosh, you sure are a tough bunch of guys aren't you? Pft.